F/O Bertram D. Barnett, son of Mr. and Mrs. Denver Barnett, graduated from Loveland High School, attended Washingon Univ. 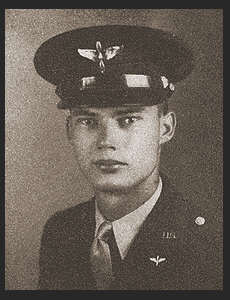 Entered the Air Corps in Dec. 1942, trained in San Antonio, Amarillo, and Hondo, Texas; Keesler Field, Miss. ; Montgomery, Ala.; Denver Colo.; Lincoln, Neb. ; Roswell, New Mexico. Discharged in November 1945.